Here in Florida, summer is just around the corner. In fact, some days it feels like it’s already arrived. Our little girls love to play outside! They don’t even need toys; they just run around like the crazy little people that they are and have a grand ol’ time. I’m afraid at least one of our little girls has inherited my fair skin. Since it is said that just one bad sunburn can cause skin cancer later in life, I try to be very careful about protecting the delicate skin that my girls have. One way we can do that is by wearing hats. What better kind than a crocheted sun hat? This sun hat is by no means a brand new look… I’ve seen similar patterns in various places on the web. But since I whipped one of these adorable sun hats up last night using my own pattern, I wanted to share it with you all. 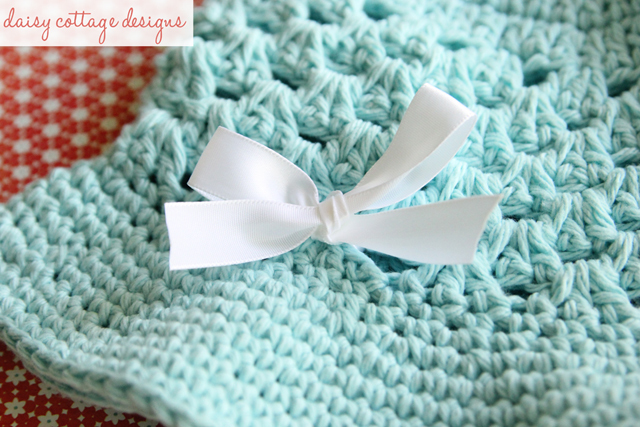 -In the increase portion of the pattern, the ch 2 does NOT count as the first stitch. -In the shell portion of the pattern, the ch 2 DOES count as the first stitch. -The brim is worked in spiral. There will be no slip stitches or chain stitches between rounds. -Ch 2 does NOT counts as the first stitch. Begin with the J hook. Round 8: sl st in the next two stitches and into the space between the dc clusters. Ch 2, 2 dc in the same space. *3 dc in the next space between the clusters* around. Sl st to the top of the ch 2. Rounds 9-13: Repeat round 8. You are now working on the brim. Remember to put a stitch marker in the first stitch of each round. Switch to the I hook for the remainder of the hat. 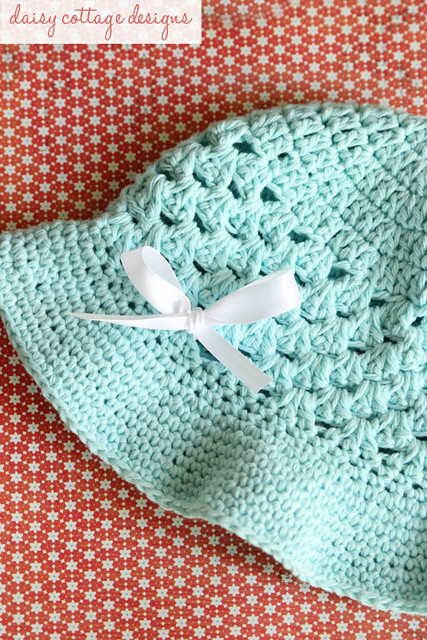 After you’ve finished your hat, you can embellish it with a simple white ribbon. If you’re feeling a little more ambitious, you could check out one of the adorable crochet flower patterns offered on the blog. This spiral flower would be a great option as would this double layer daisy. If you make this hat, I’d love to see it! Use the hashtag #daisycottagedesigns on Twitter, Instagram, and Facebook so I can see it! Very pretty! What do you mean by <i>&quot;This pattern is worked through both loops&quot;</i>? Thank you! Hi thanks so much for the free pattern I love the look of this hat. One question does each round at the top start with a ch2? Thank you so much for the free pattern! This is a beautiful little hat and was very fun to make! Thanks for this free pattern. The sun hat is absolutely adorable. I&#39;m a beginner and I&#39;ve tried a few of your patterns and I love them all. Very easy to do and instructions are very easy to follow. <br /><br />For this sun hat, do you have any recommendations for fitting a 1-yr-old? Thanks!! I made this hat with Lily Sugar and Cream. It turned out huge, too big for me even and I was hoping to give it to my 3 yr old granddaughter. I have a tight stitch so I don&#39;t usually things I make are too small, not too large. What kind of cotton yarn did you use? Hi, Beth. Any chance you skipped just one stitch rather than 2 on your first round of shells? I used Lily sugar and crème also. It was definitely too small for an adult. I need a way to make it an adult size. As a beginner, I don&#39;t know how to do that. Thanks to anyone who responds….. Thank you for making this pattern printable accessible. I love this hat! I would love to make it for my 15 month old daughter who wears hearing aids. This would be perfect for her because of the brim which would allow room for the hearing aids! If you could help with making this in a smaller size I would really appreciate it!!! I love this hat and it works up quite quickly, however, I too made this hat in Lily Sugar n Cream. It is large enough to fit me. I also made it in Permiee Yarns Home Cotton and it is quite a bit smaller. Next I will try a DK cotton. For those of you wanting different sizes would it not work to change your needle sizes down or up according to the way in which you want to go? 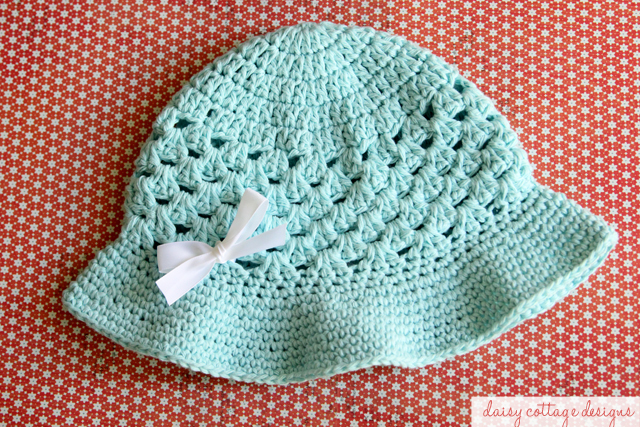 I’ve just tried to crochet this hat and I love the design. But I have some problem when it comes to the brim part. My brim turns out to be very curvy/wavy and it doesn’t flow like how it looks like in your photo. Any advise? Other than the brim, the hat is perfect! Thanks for sharing the pattern. Thank you Lauren for sharing your art. I’m looking forward to making this cute hat for my 3 yr old granddaughter for her tea parties with her 3year old cousin.. Now to fine a dress! Definitely too big using sugar n cream or Lily n cream cotton yarn with the j and k hook. I wanted this for toddler and its more large adult size. For those trying to make the hat smaller. I use Premier Yarns Cotton, it’s a #2 Fine Yarn, 3.50 oz ball, the finished hat took less than 1 ball, and I used size H instead of J and size G instead of I, and my finished hat came out to be a toddler size 2-4 years. I’m going to make another dropping 2 more sizes and see what size hat that makes, I’m trying to get infant sizes, I’ll keep you posted. Thanks for the pattern ins awesome and I finished the hat in a few hours and I’m a relatively new crocheter. I'm Lauren, the girl behind the Daisy Cottage Designs blog and Etsy shop. 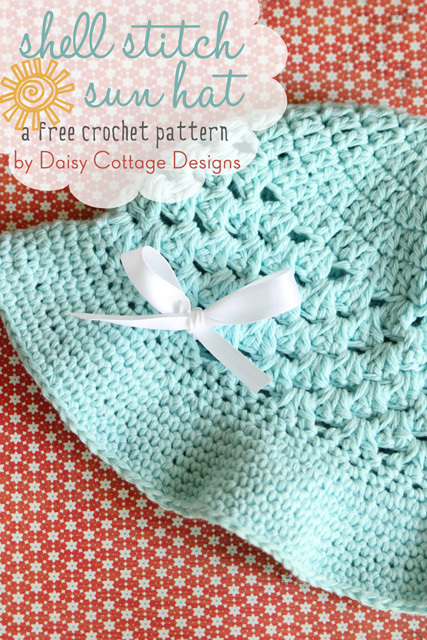 Here you'll find free crochet patterns, printables, and more. Click my picture to learn more about me!